“Paulownia tomentosa (also known as the Empress Tree, Princess Tree or Foxglove Tree) is a deciduous tree in the genus Paulownia, native to central and western China, but invasive in the US… In China, an old custom is to plant an Empress Tree when a baby girl is born. The fast-growing tree matures when she does. When she is eligible for marriage the tree is cut down and carved into wooden articles for her dowry. “Paulownia makes a good dowry. Takeshi Suzuki, chief of the Planning Section at the Mishima-machi Town Hall, recalls: “In Mishima-machi they used to call paulownia ‘gold wood’ because you could pretty much sell the wood from one paulownia tree and buy a new car with the proceeds. 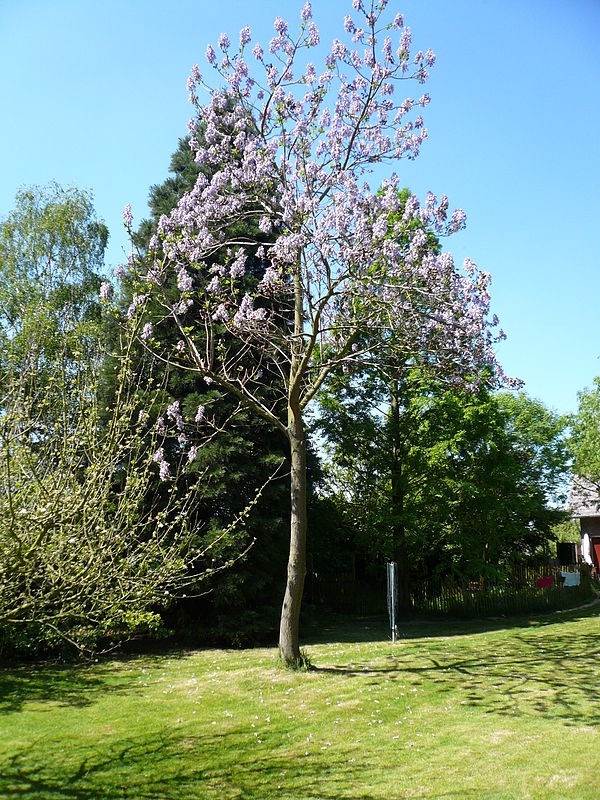 When you gave birth to a daughter, you’d plant three paulownia trees, so that they’d be grown by the time she was ready to marry, and you could use them as dowry.” Back in the 1970s, a rich person was someone who owned a lot of paulownia trees. But all good things must come to an end. After imports yanked the rug out from under the paulownia market, the wood from a single paulownia tree was only worth a few hundred thousand yen…. “Furniture, made of paulownian wood is not rare in China. On the contrary, it is considered that not even before, but also in the present, there is not a Chinese house without a furniture made of this legendary tree. Ceertainly, many other applications of paulownian wood are known. The famous musical instruments, which have been a true mystery for the Europeans, first stepped in the unexplored China and Japan were only one of them . Even the treasures of the Japanese culture – the magicians of singing and dance – geisha, used paulownia to strengthen their charm. Part of the accessories for each of them was thin, specially treated and dried branch of paulownia, which they used to make their eyebrows up, creating an unattainable mysteriousness of the look. Certainly, we can not omit the fact, that paulownia is a beautiful tree – with its large velvet smooth leaves and bright purple blossoms, it is worthy decoration of every park or garden. In China and Japan this kind of use dates from centuries and in a sense it is a national tradition. Actually how paulownia is tied to the history and being of these countries, is understood from the fact, that it is a part even of the official political life. 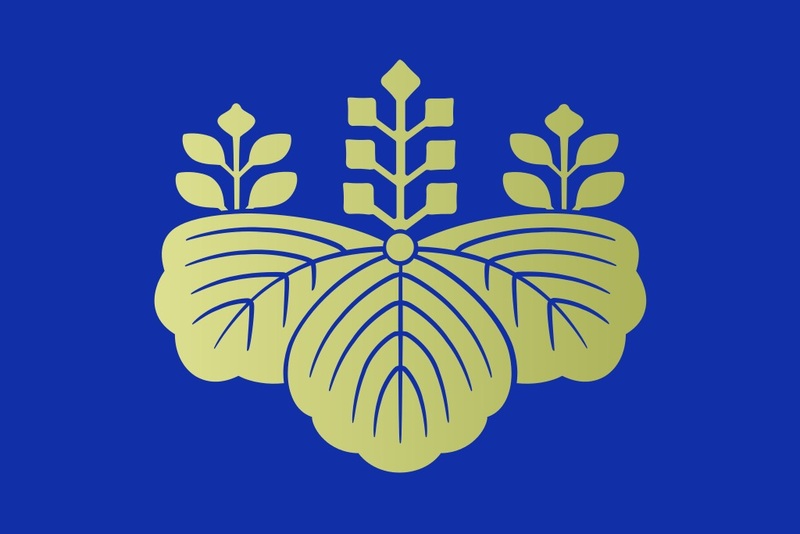 The Japanese, who like aesthetics, as the[ir] symbols have chosen paulownia precisely for an emblem in the prime minister’s office – this is so called “mon“ – a word, used to indicate and underline one’s personal or family identity; its meaning in fact, is close to “coat of arms“ and carrying approximately the same messages. So – the coat of arms in the prime minister’s office in Japan is a stylized picture of paulownia. It is hardly to find more definite manner to express the national importance of paulownia for the Japanese people by its presence on the Order of the Rising Sun. It is the first Japanese order, founded in 1875, which is serviced to persons with credits to the country. 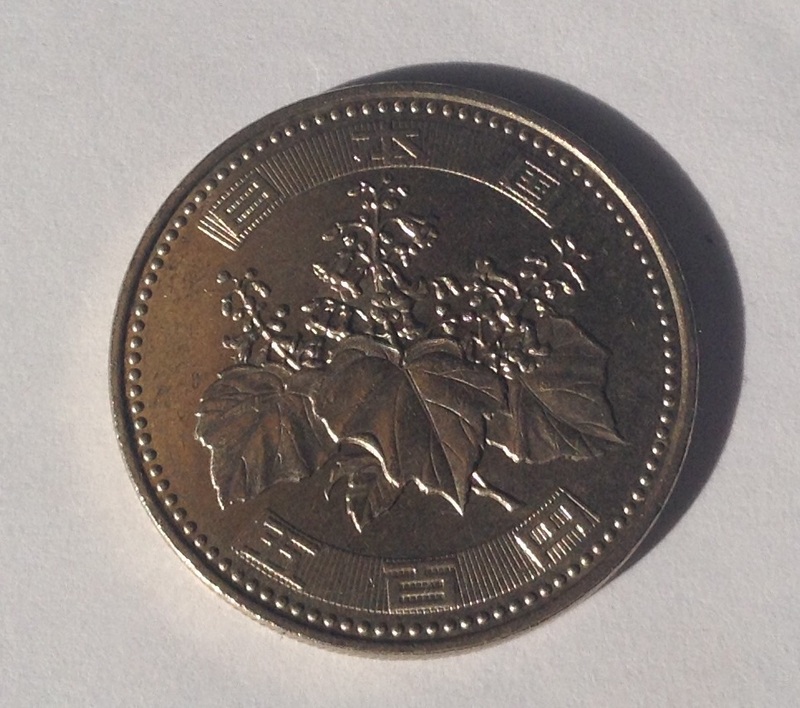 We also cannot omit the presence of paulownia on the Japanese currency – on the coins of 500 yen, it is again – the paulownia. Below: Back of a coin of 500 yen displaying paulownia. The Order of the Rising Sun with stylized leaf of paulownia. Japanese prime minister’s coat of arm with stylized leaf of paulownia. An interesting detail of Japanese lifestyle is hanafuda – special playing cards, depicting different plants. At first Hanafuda were used for different complex games, which the noblemen entertained with. Forbidden for the commonalty, the card games, especially gambling went wide in the Japanese people’s life with the opening of Japan to the Western world. Different authors have described these cards and the games played with them have become popular in many countries, including South Korea. Even the cards were called by many different names during different ages and in different countries, there is one thing that remaines unchanged – there is always a picture of paulownia on them. Apropos, it is considered, that even Yakuza (the Japanese mafia) uses them, but this rumor we did not dare to check personally. This entry was tagged Kiri; paulownia, Princesss tree.